1975 : les meilleurs films de l'année. In early twentieth century Morocco, a Sharif kidnaps an American woman and her children, forcing President Theodore Roosevelt to send in forces to conduct a rescue mission. Grizzled American private detective in England investigates a complicated case of blackmail turned murder involving a rich but honest elderly general, his two loose socialite daughters, a pornographer and a gangster. A fur trapper takes a mute girl as his unwilling wife to live with him in his remote cabin in the woods. Daniel Dravot: [admiring Roxanne, while a worried Peachy looks on] Just looking, Peachy. There's such a thing as admiring beauty for its own sake. Peachy Carnehan: [sharply] Being only human, one thing leads to another. Q: What is the song Danny sings as stands on the bridge? Take the story from a master like Kipling, give it to a director of classics like THE AFRICAN QUEEN, add a superb script that crackles with wit and cast two of the greatest modern day screen actors in roles that fit them like gloves. The result comes as near to the perfect action-adventure film as you will ever find. Kipling's rousing tale of two British soldiers in the days of high Empire keeps a tight hold of the viewer throughout. The twists of the tale are fascinating, the characters mesmerizing, the whole concept is so ingenious and full of potential that with such a team it simply cannot miss! Caine & Connery are superb together, oozing charisma and obviously enjoying themselves greatly as the two British NCOs.It's possible that neither has ever produced work to match what you will see here, it's wonderful to watch. 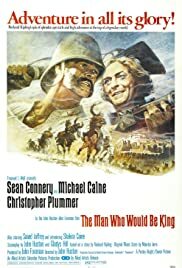 Huston's direction is top drawer and the feeling of claustrophobic Indian market places and dusty railways stations is so strong it's a relief when the two heroes of the story make their ways into the wilderness to conquer a territory and "be kings". "Billie Fish", the stranded Ghurka soldier that the pair encounter high in the mountains produces a fine characterisation by Jaffery . His eye-rolling expressions and comic timing are inch perfect in his performance throughout. Perfect too is Christopher Plummer as Kipling himself. Indeed so convincing is he as this most archetypal Englishman that one is reminded how Huston considered casting to be the most important element of his job - to paraphrase, if you find the right actor for the role, he needs no direction! I can't think of a film that more consistantly proves how right he was! Through battles, politics, greed and jealousy the two would-be kings gallop untill the final memorable explosive showdown. The last scene is perhaps the most effective and memorable of all. True pathos which tugs strongly at the heartstrings. A fitting end to a marvelous film. 120 of 144 people found this review helpful. Was this review helpful to you?